The priority of Blue Mongolia Tour is to be professional travel expert, which arranges the widest range of travel services in Mongolia introducing this country and these people to others. We try to provide fully-tailored and intellectually satisfying tours for singles, couples, families, groups and even team of scientific expeditions. WHY IT IS CALLED AS BLUE MONGOLIA? Every nation has own origin, features and even own secrets or something... . So, Every Mongolian baby has a palm sized blue-dark blue spot on his/her back, when they were born from mother. It is genetic feature of Mongol nation. Ancestors told that we have blue stamp of blue sky and our origin is from sky. Probably, That is why Mongolians believe and respect blue sky. Mongolian sky are clear and blue in most days of a year. Therefore, Travel agency founders chose blue color as a featured color for Mongolia nation and Mongolia destination, as consequently, our travel agency has the name of Blue Mongolia. By the way, This genetic blue spot is kept until when the child gets 8-10 years old, and then day by day it dissappears. 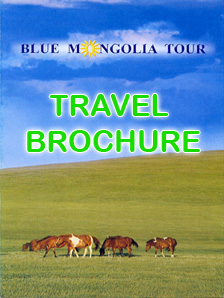 Blue Mongolia Travel is one of companies of Mongolian inbound Tour Operators. It's history is connected with Aruin company. The history of Ariun Group started in early 1993 as established dealing in field of outbound travel service. It was the “hard” time for Mongols, who faced economic crises caused by reform to transfer from “socialist” planned market into “capitalist” free market. Since 1993 it arranged commercial and business tours to China, Russia and European countries. By 1999, Mongolian economy got much better and Mongolia - nomads attract more tourists to himself. Then through, Ariun company established a daughter company as Ariun Tour, which provides inbound travel services. In 2001 Ariun tour company was changed into Blue Mongolia Tour agency. Blue Mongolia Tour agency's founders are Mr.Ogie.Kh and Mrs.Narangerel.O. Starting from 2007, Blue Mongolia Tour is implementing new project on the outbound adventure travel service for Mongolian people: travel to China, Russia, India, South Asian countries and so on.. . In present days Mr.Erdenebayar.R is working as an Executive director, who qualified in Business and Marketing, Management. The main basic department is Tour Sale & Tour Arrangement Department and it consists of several managers, who are obliged to design new travel products, to sell trips, to operate & arrange tours, to care for clients' demands and their comfort. It is lead by Mrs.Narangerel.O, who has been worked in tourism field for 20 years. The Online and Advertisement team is lead by Mr.Chinggis.A, who qualified in Information Technology & Business Management. The Financial Department is lead by Mrs.Baasansuren.N, who is professional accountant and economic expert for last 12 years.